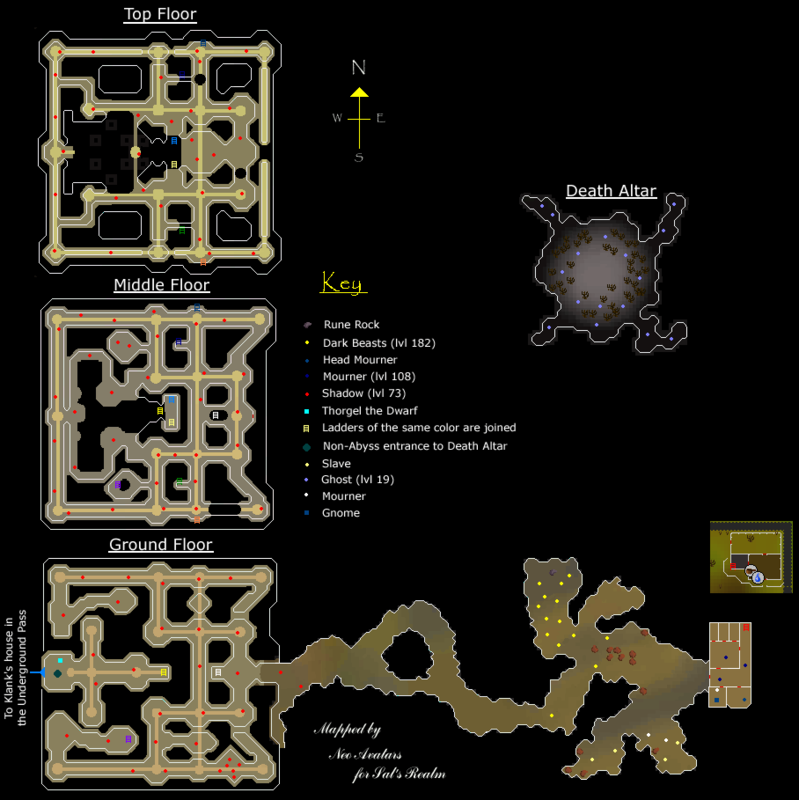 This Dungeon is used mainly for the Mourning's End Part 2 Quest, but also plays a minor role in Mourning's End Part 1. 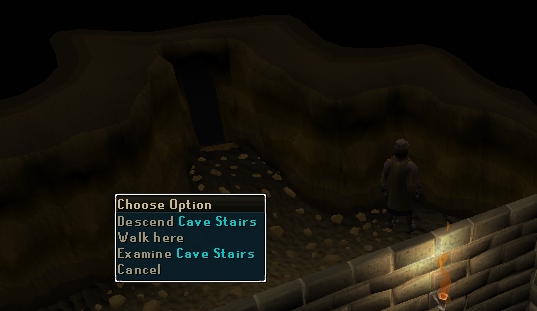 There are three floors to it and is also the home of the non-Abyss route to the Death Runecrafting Altar. There are three entrances to this Dungeon. 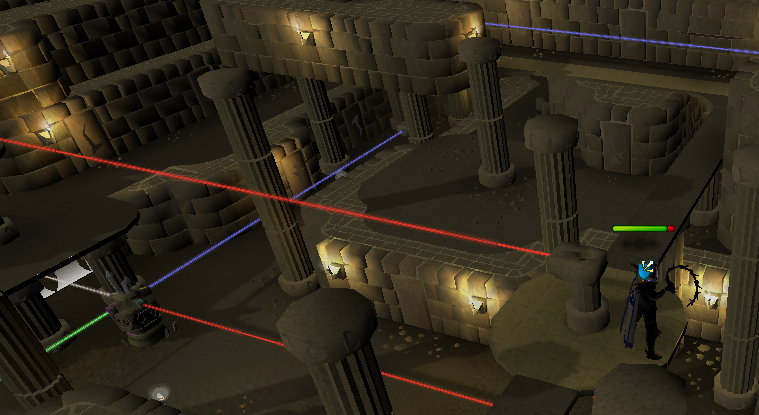 One is through the Abyss and then the Death Rift, one through the Underground Pass and the other is down a Trapdoor in the building in the North-East corner of West Ardougne. To enter from the Underground Pass you must go to the place that Klank and his friends live and the climb down the stairs behind their house. 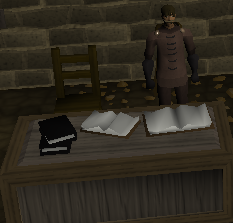 To enter from the Abyss you must go into the Wilderness north of Edgeville, make the Zamorak Mage teleport you, make your way to the middle ring and finally enter the Death Rift. 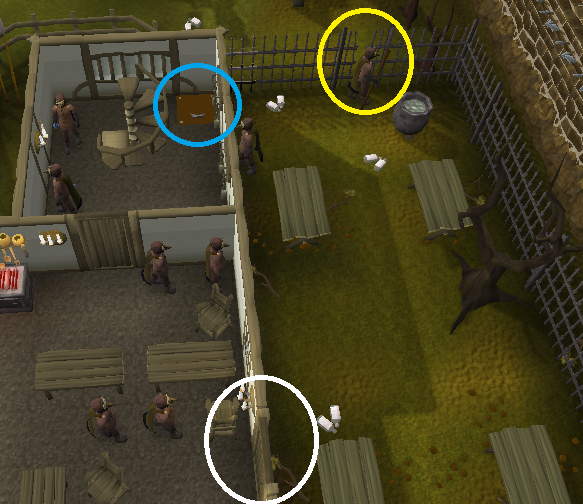 To enter from West Ardougne you must climb through the fence (yellow circle) then make sure you are wearing your full Mourners outfit and nothing else before entering the building (white circle). Once inside go through the door and climb down the Trapdoor (blue circle), making sure that you are still wearing no more and no less than your full Mourner outfit. The reason for this is because once down the ladder if you haven't gone through the locked door and are wearing anything but full Mourners you will be attacked by a level 108 Mourner. To get through the locked Door you need a New Key. You get this near the beginning of the Mourning's End Part 2 Quest. Once you have used the Key with the Door and gone through to the South are some Slaves being bossed around by two Mourners. The Mourners have two lines that they will say every now and again. The first thing that they will say is "Get to work", while the other is "Work harder or your families will join you down here!" If you head North you will come across a room to the North with some plain rocks that have no Ore in. Just round the corner from this is the home of a Rune Rock. 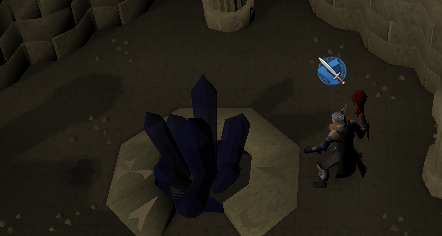 "Yay, a Rune Rock", you may be thinking, but there is one problem. 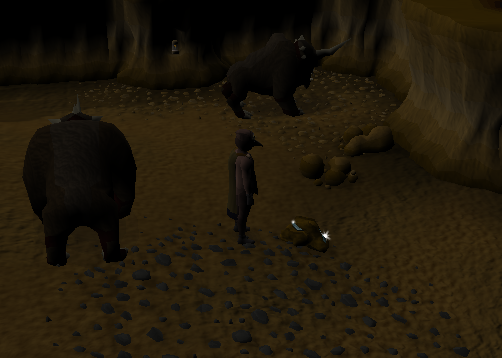 The area around it is full of level 150 Dark Beasts. 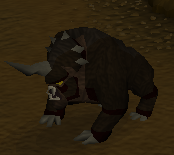 These monsters require level 90 Slayer to kill and without the Protect from Melee Prayer can hit for up to 233 Life Points with melee and 294 with magic. Luckily, they are non-aggressive and will only attack if you attack first. So don't attack them! 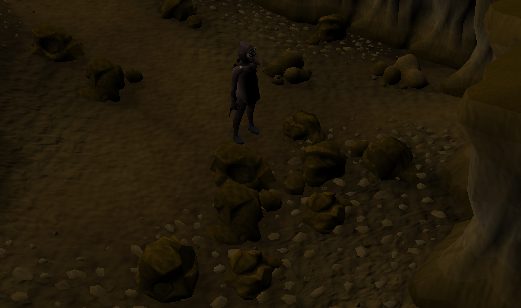 Mining here may not be very efficient because there is only one rock and it is usually empty in most worlds due to some other players. If you go further along the tunnel to the west you will come to the Temple of Light. 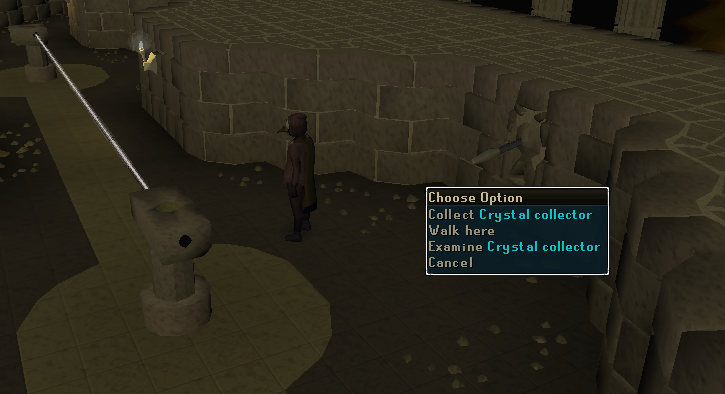 To enter from this side after completing Mourning's End Part 2 you must have the Crystal Trinket that you got as a reward for completing the quest in your inventory. 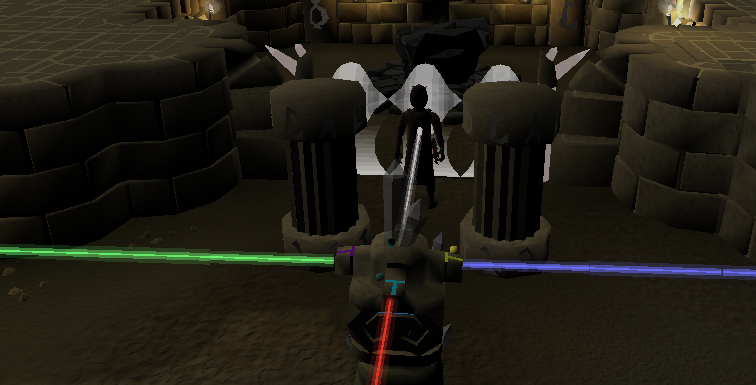 If you try to cross the line that is the entrance without the Trinket in your inventory you will be bounced back and get this message in your chat box. Once you have entered the Temple straight ahead will be a Crystal and a Staircase that you can climb. Once up the stairs to the East is a lever on the wall that you can pull to reset the light maze and then collect the Mirrors and Crystals from the tray. There is also the Pillar that you must place a Mirror in as the first step to opening all the Doors during Mourning's End Part 2. In the South-East corner of this floor there are some hand-holds. They are used during door 1 and 5 of Mourning's End Part 2 and can get rather annoying. This is because they are fairly hard to cross and if you fail you will land on the floor below in an area full of Shadows and get hit 50 damage. 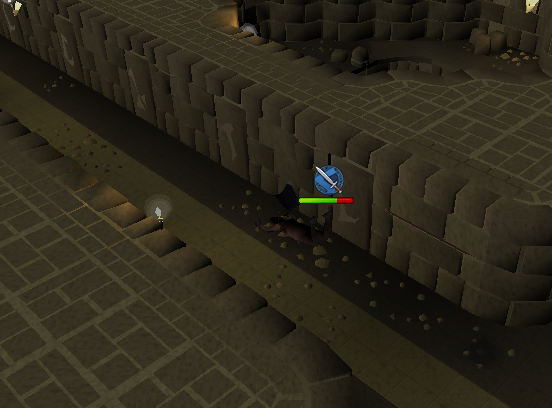 Before attempting to cross these it is recommended to take a sip of Agility Potion to decrease your chances of falling. Throughout the Temple are traps. They can get annoying because they stop you going where you are heading, but they don't move and are fairly easy to remember the locations of. If you fail to jump over them you will get hit 50 damage and if you manage to pass them you will fly over the top of the razor sharp blade. They are fairly easy to pass even with a low-ish Agility level and can even be found before you get to them. In the Southern half of the Middle Floor is a room that you are completely safe from Shadows in. 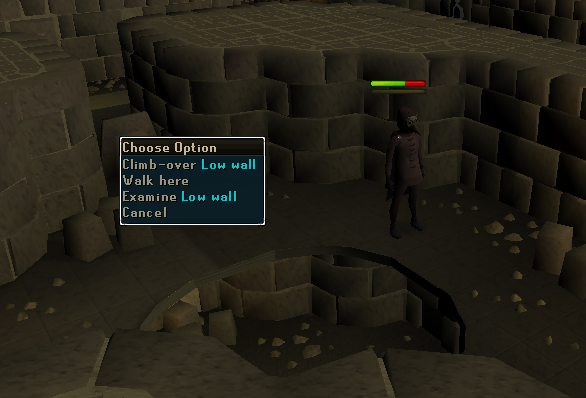 To enter you must climb over a low wall. During Mourning's End Part 2 you enter this room during Door 4. This is because of the large hole in the center of the room that leads down to the Ground Floor. To get down you must use a Rope with the Rocks on the West side of the hole, but the Rope will stay forever and you will never have to replace it. At some points in the Temple there are blocked paths and holes. The rocks from the hole above have fallen down to the floor below, making the paths on both floors inaccessible. At the North of the Middle Floor is a ladder leading up to the Top Floor. Beside this is a Pillar and if you reflect light from this Pillar to the West it will go through a magic Pillar that has the ability to change the color of the light as it passes through. All the ladders in the Temple are possible to fall when climbing up or down them. 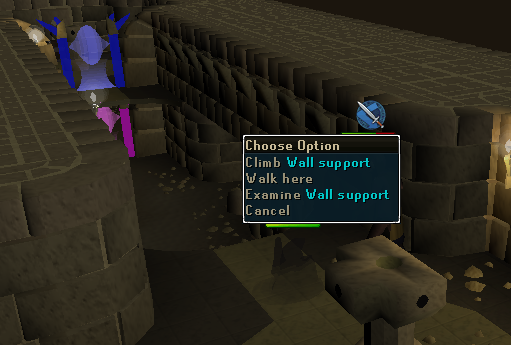 If you do fall you will be at the bottom of the ladder, having been hit 60 Damage with this message in your chat box: You cannot fall when climbing the stairs though. Once up to the Top Floor there are lots more Traps than on either of the other two floors and there are also quite a lot of things around. On the East of the Floor is the Crystal that is the center of the plot for Mourning's End Part 2. 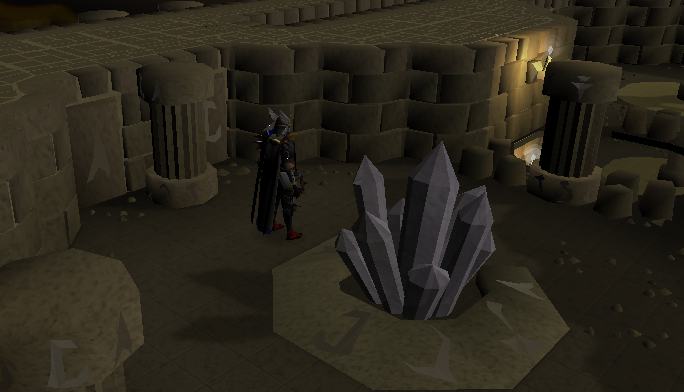 For the main part of the Quest it is dark, however at the end of the Quest when you place the repaired Crystal inside it it becomes all White and bright. Near the center of this floor is a bridge that is a long way above the floor below. You can see down to the Ground Floor and how many beams of light are pointing down there. It is not recommended to come here if you are scared of heights. In the image below you can also see that when you kill a Shadow it goes from being a small, flat thing with almost no height at all to a giant beast towing a long way above your head. In the middle of the Top Floor there are also some stairs that give a quick route from the South to the North of the Floor and back again. Down these stairs is also safe from Shadows. If you carry on down these stairs you will come to a door that you can only go through after completing the light maze for Door 6 in Mourning's End Part 2. 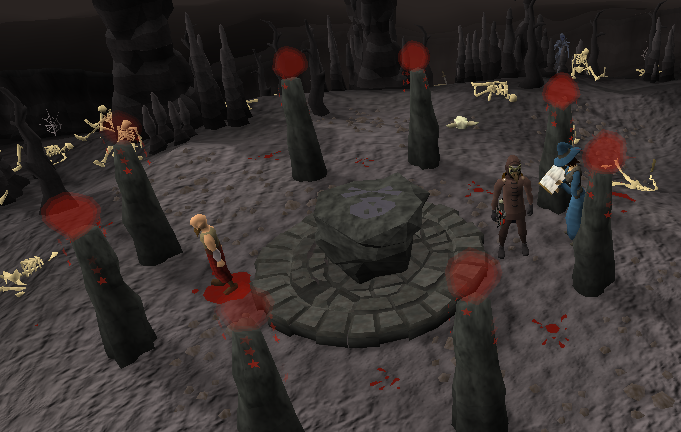 Through the door you will come to a Pillar that you must rotate to be able to enter the entrance to the Death Altar. Before leaving you should turn this back so you don't have to come through the Underground Pass or Abyss to get back into the Temple. From here you can either enter the Ruins to craft some Death Runes, go through the Tunnel at the back of the room the appear near Klank's house in the Underground Pass, go back through the Door you entered from or talk to Thorgel the Dwarf. 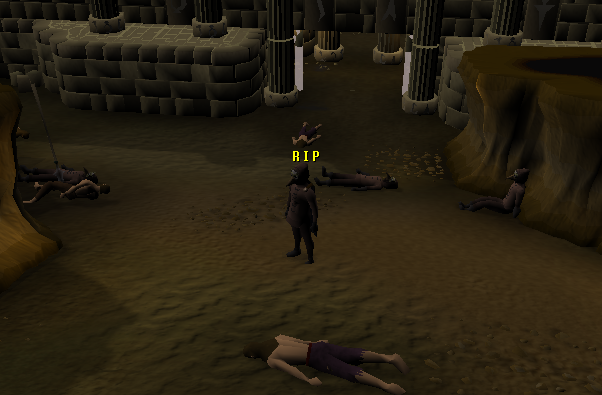 If you enter the Ruins you will appear in the Death Altar. 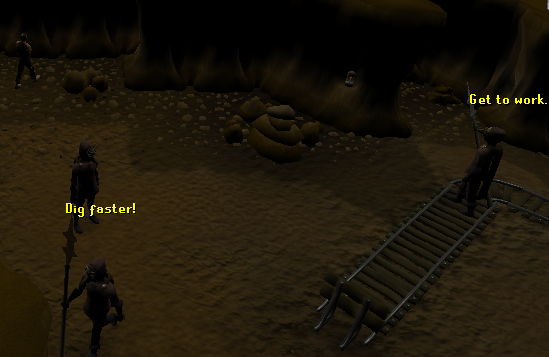 It is full of level 17 Ghosts and is a popular place for higher level Runecrafters to train their Runecrafting through the Abyss. This is because Death Runes give 10 exp each, while other ones like Nature and Law Runes may be easier to sell, but they don't give as much exp. 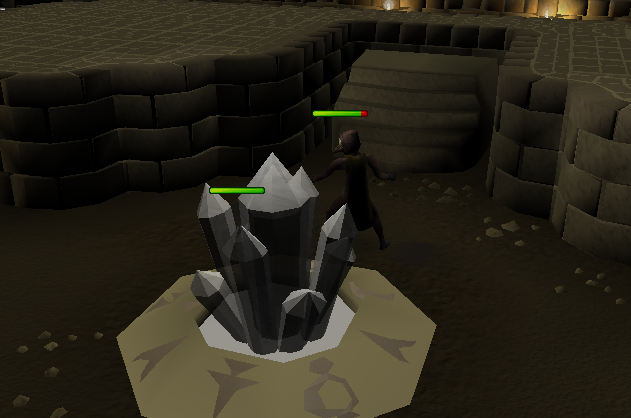 The Shadow is level 136 and can strongly interfere with your questing. It has a very high Attack, medium Strength and low Defence level. They can hit high so Protect from Melee is recommended at all times when running around the temple. When they attack you or die they will stretch into a tall monster rather than being flat against the floor. Bringing prayer potions are recommended if you plan on spending a lot of time in the temple. These will only attack you if you wear anything other than full Mourners before going through the locked door at the start of the Dungeon. If they do attack you just go up the Trapdoor, make sure that you have to correct equipment on and come back down again.